On November 15, math teacher Andy Falk took nine math students to UNL’s annual Math Day. 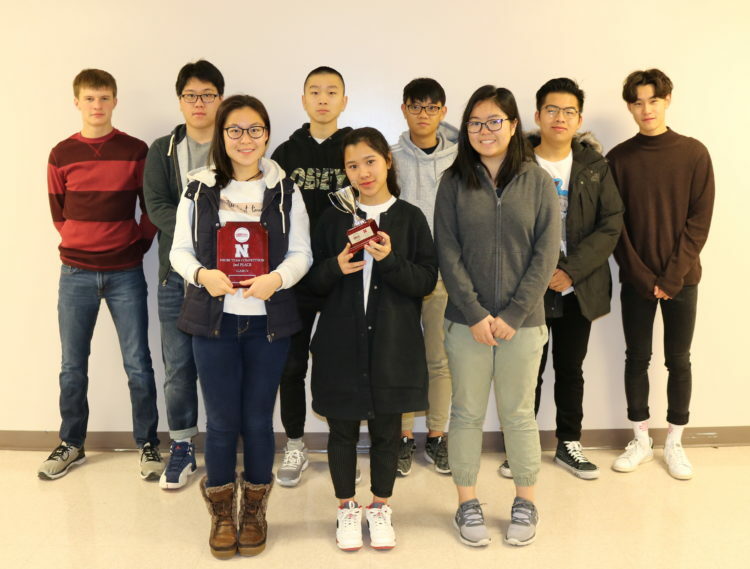 1,359 students from 97 Nebraska high schools participated in the day, which consisted of individual PROBE (Problems Requiring Original and Brilliant Effort) competitions and a team math bowl competition. The top individual scores from each team were also combined to create a team PROBE score. The NC team placed third in its division in the math bowl tournament and second in the PROBE I team competition. In the individual competitions, senior Arwen Zhang placed 23rd in the PROBE I competition and tied for 9th in the PROBE II competition. Due to her placing in PROBE II, she received a $2,000 UNL scholarship. Front: Arwen Zhang, Linh Nguyen, Manisa Hongdilokkul. Back: Ben Janssen, Til Lyu, Kevin Yu, Duong Ha, Johnny Wu, Sam Qu.